Nikon D700 Is Official – Photoshoppers To Now Move Onto The Canon 5D Mark II | OhGizmo! By Andrew Liszewski on 07/01/08 • Leave a comment! This morning Nikon officially announced their D700 digital SLR, which you can basically think of as a D3 that’s been crammed into the considerably more compact body of a D300. While that makes the D700 the company’s first compact professional DSLR, there are some trade-offs when you compare it to the D3. While it has the same 12.1 megapixel full frame FX sensor and image processing engine as its bigger brother, it does use a different viewfinder prism that only gives you about 95% coverage. It also has a different shutter that’s only good for 150,000 exposures compared to the D3’s 300,000, and a smaller battery. It’s also lacking an LCD info panel on the back and only features a single compact flash card slot. But on the other hand it does include a built-in pop-up flash, and even a self-cleaning sensor. 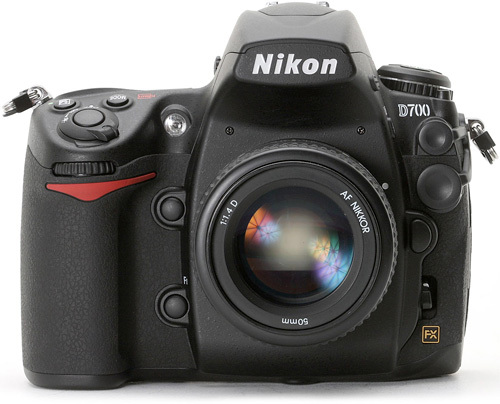 The D700 should be available sometime in late July which is of course perfectly timed to get it in the hands of the thousands of photographers who’ll be attending the Olympic games in August. It has an estimated price of $2,999.95 but that’s just for the body. If you decide this is your first SLR camera you’ll need to get yourself a lens as well. And for a full break down of all the D700’s features and specs I suggest checking out the official press release on Nikon’s website.